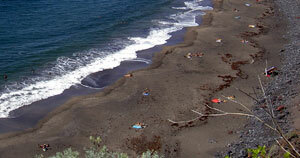 Playa el Arenal is a good Tenerife surf beach later in the day. Find out all about it! Playa el Arenal with its 740m length is a black Tenerife beach between the Tenerife pools of Punta de Hidalgo and Baja Mar as well as Baja Mar beach. We passed there by the coastal road during summer holidays when many bathers could be seen in and out of the ocean. Mind in winter that Beach Arenal has less of a sandy shore. The beach belongs to Punta de Hidalgo the most north western location of Tenerife of Canary Islands of Spain. Coastal roads as well as inland roads take you to the beach of el Arenal in direction of Punta de Hidalgo. An easy way leads off from San Christóbal de la Laguna. Three Titsa bus lines connect it with the capital and or with La Laguna. Reach the Arenal surf beach from the main road (carretera general)by Hotel Neptuno by taking steps from it which lead to the sea. Please, mind that neither this beach nor its access is for the unfit. It attracts local kids and students from La Laguna. Most of them prefer it for its surf and for not being a tourist hot spot. There is also a camping and caravan park called el Buigo near the windy Punta Hidalgo billboard, for hiking. There I was caught on camera, as shown beside. This was, before we proceeded to the Bajamar pools and beach as well as to Playa Arenal. However Playa San Juan is nearer to the camp site than Playa Arenal. I saw people camping there during my first trip in 1997 but, discovered none on the day, when I glimpsed Playa Arenal. is very clean and unspoiled. It has a water temperature of 21 Degrees Celsius by the end of June. There are no amenities, like beach guards, change rooms, toilets and tea-rooms. Mind, there will be nobody putting up a red flag or even a blue one. Pack some drinks and sandwiches and do like the locals do. Come to enjoy the sea. 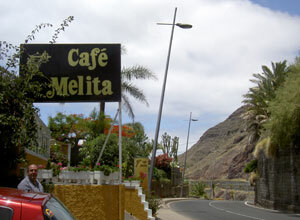 Have Tenerife's best apple pie with cream and vanilla ice and Melitta coffee at Café Melita, (Tel:922 540 814) unless you prefer a local coffee brand. We walked back from the surf beach for about three minutes on the coastal road Carretera General Punta Hidalgo to number 171 towards the Western Punta of the Anaga massif . Contemplate the entire Arenal beach from this German cafe with ocean views. By the way, this café is one of three more Melita Palmelita coffee houses. Best surf of Playa el Arenal Beach late in the afternoon. This was a hot tip by a waitress of nearby Melita Café on the coastal road. The view from the Carretera coastal road reveals arid vegetation on a steep rocky slope. There, the terrain slopes down by about 20 meters. Good fishing by Arenal Beach? Discover colorful fishing boats far out at sea. Their location is too remote to capture on camera. The small ships are dancing gently on calm waves on the horizon. By the looks of it, this is where to find a good fishing spot. Fishermen are said to come there from the nearby el Puertito (little harbor) of Punta de Hidalgo. The day on which we looked in amazement at the slightly crowded Playa el Arenal surf beach was an ordinary week day. It wasn't holiday time yet at the end of June 2008. However, it was Siesta time. Hence, we were surprised to see at least 30 people by this seashore. However, I would always opt for the relatively new small sandy Baja Mar beach where it's much easier to get to. Besides, that beach at Baja Mar which is three minutes by car from the surf beach has a lot more in stock for you. Distance by car from Tenerife North to Playa el Arenal. More detailed instructions on which roads to get there fastest are to be found at page Beach Baja Mar of Tenerife. This includes other interesting info. 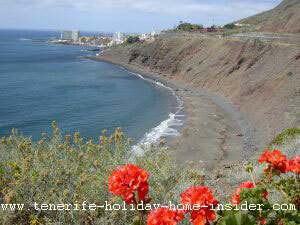 Please, go back from Playa el Arenal to Tenerife beaches with many a surprise.